On July 12th 2016, the Bangladeshi Flood Forecasting and Warning Centre (FFWC) issued a 10 day forecast stating: there is a 30-40% chance that the Jamuna River at Bahadurabad will exceed the national ‘danger level’ on 22nd of July. On the 27th of July it was clear that this flood could break ‘record high water level’ and that the flooding could last a fortnight. Remember: this country’s history is marred by regular and vast floods of all kinds – monsoon floods, tidal flooding and storm surges linked to cyclones, flash floods, and coastal flooding. Floods are then closely followed by secondary hazards: landslides, waterborne diseases, infrastructural damage. This low-lying country and its people have prepared for and dealt with regular floods since time immemorial. But the floods are getting more severe due to climate change, causing sea levels to rise. A deadly combination for the tenth most densely populated country in the world. In 2016, the worst-case scenario forecasted by the FFWC came true. On the 29th of July, the peak of the flood broke record levels. Water levels only returned below danger levels on the 5th of August. In Jamalpur district adjacent to the Jamuna River, the worst affected area during 2016, the flood took the lives of 30 people, affected 850,000 people and destroyed 2000 kilometres of road. Soon after, diseases started spreading, there was a lack of clean drinking water, farmers lost their crops and livestock, and displaced families were made more vulnerable by having to use shared facilities. Across Bangladesh, the 2016 floods affected 3.7 million people across 19 districts and killed 106 people. 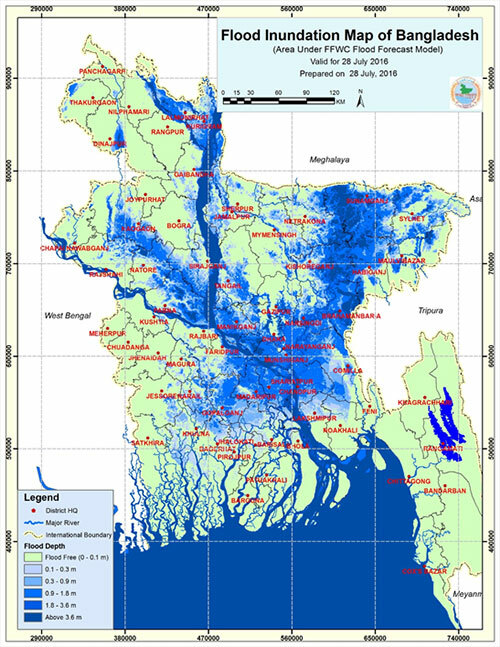 This is a map issued by the Flood Forecasting and Warning Centre on 28th July 2016, which shows the extent of those floods across Bangladesh. What could have been done differently using the forecasts that were issued? Knowing what we know now, how can we better anticipate future floods? What can we learn from this to limit the damage caused by future floods? Start Fund Bangladesh members take part in a workshop on how to anticipate crisis, and raise Anticipation alerts. Snake bites – surprisingly, snake bites have been recorded the second-most common cause of flood-related deaths in Bangladesh (the first being drowning). One thing that could be done in anticipation of future floods is distribution of snake bite kits or pre-positioning/replenishing the stocks of anti-venom at health centres. Disease outbreaks – pre-positioning of clean drinking water, water purification kits, chlorine kits (to reduce the spread of cholera) and taking other preventative medical measures can drastically reduce the death toll of predictable floods. Vaccination of cattle – livestock are often the main source of income for a household. Ensuring that livestock do not get sick in floods, by vaccinating them in advance of a predicted flood, can prevent loss of cattle and therefore, income. Saving fish ponds – raising the pond dike to protect fish ponds before the floods can ensure that fisheries don’t get swept away in floods, and with these, entire livelihoods. Saving fresh/clean water sources – raising the pond-dike to a height that is not prone to flooding/inundation, so that affected communities can use it as a fresh water source once flooding has occurred. Salinity – this is a problem in coastal regions or following tidal surges after cyclones. As sea water mixes with fresh water, it contaminates fields and fresh water drinking sources. Raising crop beds to avoid these being flooded is one option. Another is using dams and floodgates before the flood to manage run off/surface drainage. This has already been trialled in Bangladesh (especially in coastal regions) with strong community participation. There are many more early actions (that are less Bangladesh-specific and could work in a range of contexts) listed in our pre-alert guidance notes. At the Start Network we will continue exploring what contextually-relevant anticipation means and will continue to encourage such discussion amongst members. 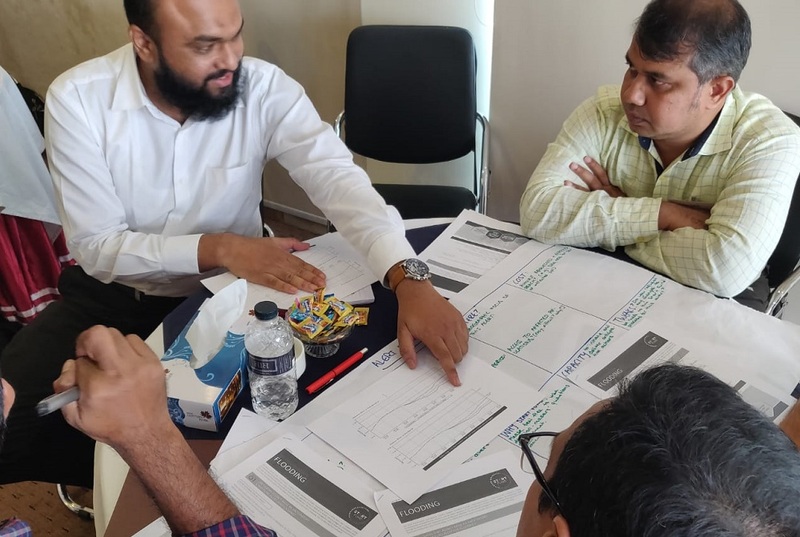 We will adapt the anticipation window for the Start Fund Bangladesh (SFB) – ensuring that materials are translated into Bangla and made accessible to the local and national NGOs who will be joining our membership. 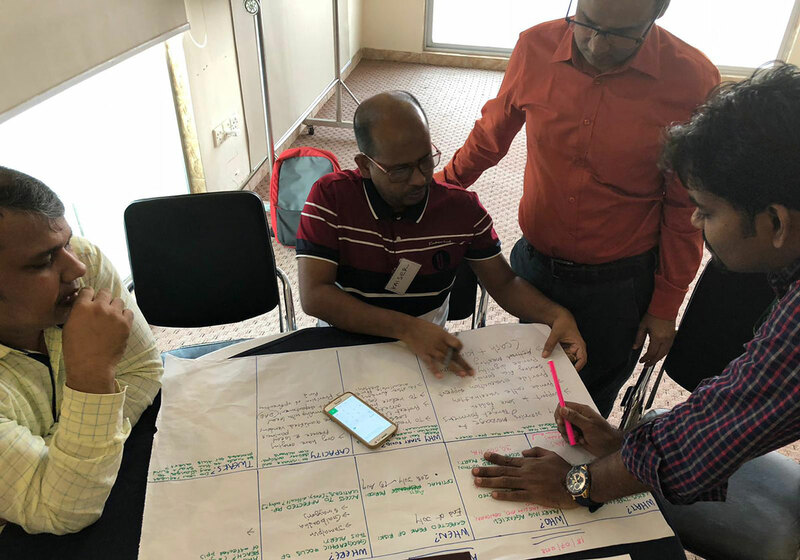 As a result, we hope that in future seasons of risk our members will be able to take context-specific action earlier and mitigate the damage caused by predictable disasters in Bangladesh. Get on overview of all crisis alerts in Bangladesh using our interactive mapping tool. Read more about the Start Fund Crisis Anticipation Window. Start Fund Bangladesh members take part in a workshop on crisis anticipation.